Amazonia Ambient Project - ARTE AMAZONIA provides a global voice through art for the indigenous cultures of the Amazon. this project deals with Amazonian reality and its current implications, including ecology, shamanism and the encounter of cultures. 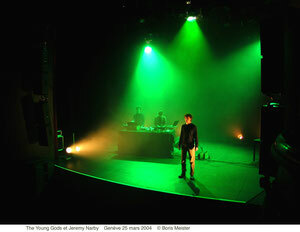 The Young Gods are best known as an explosive live act, tracing their origins back to 1982, but for this project, Music for Artificial Clouds (2004), they are ambient and dreamlike. It is meditative music for relaxation. It draws listeners into a state of availability and seeks to link them to the world, rather than to extract them from it. As Brian Eno put it: "Ambient music is intended to induce calm and a space to think. Ambient music must be able to accommodate many levels of listening attention without enforcing one in particular; it must be as ignorable as it is interesting." The album is also environmental music, based on a composition initially played at the Arteplage of Yverdon on the shores of Lake Neuchtel, during Swiss national exposition Expo.02. The band approached composing the piece by looking for sounds generated by computer, which they then mixed with a bank of natural sounds recorded by Franz Treichler during a recent trip to the Amazonian rainforest. 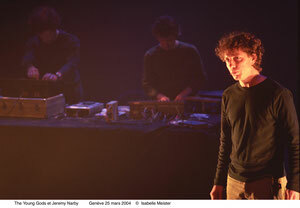 The resulting musical landscape is inhabited by imaginary animals, resonant plants, electronic breezes, distant melodies and artificial clouds. The live performance features the anthropologist Jeremy Narby, who talks about his explorations of shamanic cultures in Amazonia. He is a doctor in anthropology from the University of Stanford, who has worked with indigenous people in the Western Amazon for two decades on questions of territorial rights and bilingual, intercultural education. He has written several books, including "The Cosmic Serpent, DNA and the Origins of Knowledge" (1998, Penguin Putnam, New York), which breaks new ground in showing connections between indigenous knowledge and science. He also co-edited with Francis Huxley the first-ever anthology showing the evolution of Western attitudes towards shamanism on a worldwide scale, called "Shamans Through Time: 500 Years on the Path to Knowledge" (2001, Penguin Putnam, New York). He works as coordinator of Amazonian projects for Nouvelle Planète, a Swiss NGO. Surprisingly, the Ashaninca who accompanied me in the forest had names for almost every plant, and ascribed uses to about half of them. They use plants as food, building materials, cosmetics, dyes and medicines. I soon saw that they have an almost encyclopaedic understanding of plant properties. They know plants that accelerate the healing of wounds, cure diarrhea, or heal chronic back-ache. I tried these plant remedies on myself each time the occasion arose, only to find that they worked. So I began asking my Ashaninca consultants how they knew what they knew about plants. Their answer was enigmatic. They said knowledge about plants comes from the plants themselves, and ayahuasqueros, tabaqueros, or shamans, take a hallucinogenic plant brew called ayahuasca, or eat tobacco concentrate, and speak in their visions with the essences, or spirits, which are common to all life forms and are sources of information. They said nature is intelligent and speaks with people in visions and dreams. But one night after four months in this village, I was in a neighbouring village drinking manioc beer with some men and asking them about the origin of their plant knowledge. And one man said: "Hermano Jeremias, Brother Jeremy, if you want to know the answer to your question, you have to drink ayahuasca, and if you like I can show you some time." He called it the television of the forest and said it allowed one to see images and learn things. I grew up in Switzerland, where LSD is an indigenous product, so I had tried it several times and thought I knew about this sort of thing. So I said ok. Several nights later I found myself with this ayahuasquero on the platform of a quiet house surrounded by the sounds of the forest. He administered the ayahuasca, which is a bitter brew, then, after a long silence, he started singing songs in the dark, loops of ungraspable sounds and slightly dissonant melodies. Images appeared in my mind, and I soon found myself surrounded by enormous fluorescent serpents that were 15 yards long and 1 yard high, hair-raisingly real, which started talking to me in a kind of thought language, telling me things that were painfully true about myself. They said, you are just a human being, a tiny human being. And I saw, looking at them, that they were right, that my materialist perspective had limits, starting with its presupposition that what my eyes were showing me did not exist. And I saw that my worldview had bottomless arrogance, which caused it to collapse in front of me. See Jeremy's latest music project, 'Ayahausqueros' HERE.